Home » Waddle, Waddle, Waddle at the Zoo! T-Bone and I went to the zoo this morning with some of Bee’s family and had such a great time! The weather was great and (most of) the animals were out. What more could you ask for? I have been to our local zoo many times, thanks to my days as a nanny, and it is one of those places I don’t get tired of. This was our little girl’s first time at our zoo, though, and at 13 months and walking she is definitely old enough to love it! 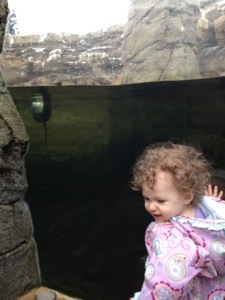 I think her favorite animals of the day were the penguins (Woodland Park Zoo has a wonderful penguin exhibit). We have an animal book with a picture of a penguin in it which she loves to look at and rock side to side, waddling like a penguin. 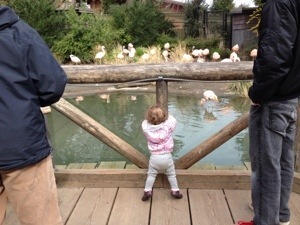 She “waddled” while we watched the funny little birds swim and waddle around. 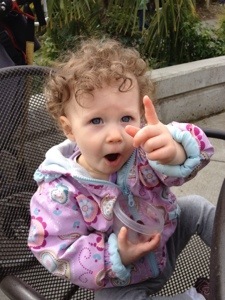 We had lunch while we were there, and T-Bone spotted the crows on top of the building, pointing them out to us to make sure we all saw as she sat in a big-person chair all by herself. We got to see the 4 new lion cubs (sorry, no pictures due to the huge crowd of people looking at them), the big brown bears, giraffes, hippos, and more. We finished up at the flamingoes, which is one of my favorite exhibits, so I was glad to see she liked the flock of pink birds, too. 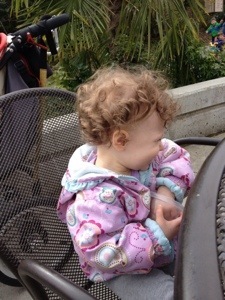 Thanks to Aunt H for suggesting such a fun outing! We’ll have to do it again. ← Is That the Same Girl?